Written in 2001 by Swiss trumpeter and professor Michel, this piece consists of two stylistically contrasting movements. According to the program notes, the first movement, Choral, “is reminiscent of the subtle and haunting polyphony of the Renaissance in which sombre phrases slowly overlap and are heard in a perspective of infinity.” The second movement, a lively multi-meter Toccata, contains prominent quartal and quintal harmonies that provide a satisfying contrast to the relative harmonic stasis of the Choral. Additionally, the Toccata’s energetic dance rhythms and a series of dynamically rising phrases lead to a robust conclusion. This piece is simply constructed, and can be easily understood by trombone ensembles across a wide range of ability levels—perhaps from the advanced high school level and beyond. All parts are written in bass clef, despite the first part ascending to c2 and the second to a-flat1, which makes the piece a productive choice for competent players that may not yet be versed in alternative clefs. The lowest part is written for bass trombone, descending to GG, but all other parts are easily playable on tenor. The first movement’s canon-like gestures and consistent g-minor tonality create ample opportunity for a well-blended ensemble sound, while the second movement’s driving rhythms and metric complexity may present some challenges. 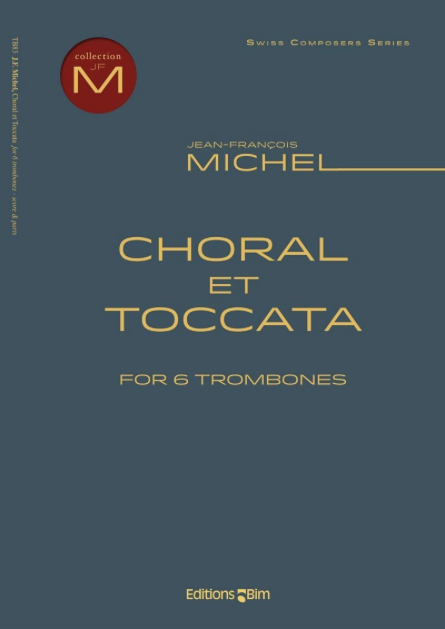 Choral et Toccata is a useful piece for young trombone ensembles at the undergraduate level.